It's Wednesday, and you know what that means: another recap of Gotham: a Dark Knight. This week's episode is "The Blade's Path." Or, alternatively, "The Odd Couple." Warning for violence to a minor and spoilers. So, Gotham's hospital apparently needed more room and the orderlies (who are way too happy about this situation) have been told to throw a comatose Butch Gilzean/Cyrus Gold into a marsh that's been tainted by Indian Hill chemicals. And what, you may ask, is this marsh named? Slaughter Swamp. Over at the GCPD, Bullock and Gordon are arguing over the licenses again. Shocker. Gordon also wants to know when Ra's will be brought to trial, but it seems like that might be a tricky subject. Meanwhile, at Wayne Manor, Alfred tells Bruce that he needs to get some sleep and stop blaming himself for Alex's death. Bruce insists that it's his fault, and I kinda agree with him. Sure, Alex told Bruce to keep the knife away from Ra's, but I don't think he meant for Bruce to do that at the expense of his life. Bruce made a big mistake. Anyway, Bruce has been reading through Winthrop's translation of the knife's inscription and has an interesting interpretation: he believes the knife can be used to kill someone who's been raised by the Lazarus Pit. He theorizes that Ra's actually wants it so that he can destroy his only weakness. Alfred sees what Bruce is getting at and reminds him of the vow he made last season. The scene shifts to Bruce and Alfred attending Alex's wake/funeral. As Bruce stares at his dead friend's coffin, he hears the whispers of people gossiping about the kid's death. It's eerily reminiscent of his remarks to the Shaman in season 3, when he remembered the awful whispers of people talking about him at his parents' wake. Bruce is just as upset here. Gordon arrives at the funeral and pulls Alfred aside to tell him that Nanda Parbat is going to extradite Ra's al Ghul. Gordon again expresses frustration that Alfred hasn't been keeping Bruce out of danger and asks Alfred not to tell Bruce about Ra's being released. Alfred agrees that it's best to keep Bruce in the dark so he doesn't do anything stupid, but Bruce has been eavesdropping, so that ship has sailed and it's time to kill the Demon's Head. And, speaking of the devil, Ra's gets a visit from Barbara, who offers to break him out of Blackgate. He says he only summoned her to say goodbye, but she insists that he promised her more than just her life back. He agrees and places his hand over hers. As he does, some weird, glowing magic flows out of Ra's and into Barbara. But what is it? "You'll see," he replies. Over at the Slaughter Swamp, Butch/Cyrus emerges from the water, pale and haggard. He comes upon a group of campers singing along to a recording of the nursery rhyme "Solomon Grundy." The campers, to their credit, offer to help him, but Butch punches them all out, with the light-hearted yet creepy song playing in the background. Butch begins to recite "Solomon Grundy," assuming the words refer to him. (Note: hereafter, Butch will be referred to as Grundy). Meanwhile, Mr. Penn reports to Penguin that 86% of Gotham's crime is accounted for under the licenses. Penguin, however, is still upset about the other 14% and wants to send Firefly out to "make some examples." Sofia Falcone enters, saying it's not necessarily that simple. She asks Penguin to lunch, saying that a public scene of them together could sway remaining Falcone loyalists to his side. He initially refuses, but she persuades him to go through with it by reminding him that her father's name still holds weight. He then tells Penn to add a question mark to item #34 on his checklist: "Kill Sofia Falcone." And, in the third pharmacy heist since Mr. Freeze and Fish Mooney, Nygma yells at a pharmacist to get him pills that will make him smart again. When the guy asks what Nygma's symptoms are, he lists, among other things, "an inability to make riddles." The pharmacist tricks him into looking for a bottle of sugar pills before stabbing him in the hand and calling the police. Nygma manages to get away, but he ends up running straight into Grundy. He's befuddled to see his old enemy alive but claims they were friends and hilariously comments "Wow, you don't get much sun." Nygma then tries to run away, but Grundy knocks him out. Over at the GCPD, Alfred asks Gordon for help tracking down Bruce, who snuck out and is probably planning to kill Ra's al Ghul. He says that Gordon can berate him for his bad decisions as a guardian once the boy is safe. Gordon replies "Oh, I will," but agrees to help find Bruce. I like how the writers are finally having someone question the way Alfred is raising Bruce. As I said last week, if you don't know this kid is going to become Batman, everything Alfred lets him do seems insane. Gordon is realizing that now. Speaking of Bruce, he's all suited up (and wearing a hood over his mask, which is a nice addition) and uses a suspiciously bat-shaped grappling hook to climb over the walls of Blackgate. He manages to sneak past the guards and cameras with surprising ease and uses a stolen ID to open Ra's cell. He finds the man asleep. Bruce takes off his mask (for no apparent reason, as usual) and raises the dagger to kill, but stops himself. Ra's, however, was faking and leaps up to take down Bruce, after berating him for his lack of resolve. The guards, who are apparently working for Ra's, drag Bruce away. (At least that explains why it was so easy to break into Blackgate). A little while later, Gordon and Alfred show up at Blackgate. The guards let them in, but say they need all of their weapons (which is odd, given that Gordon is a cop). Gordon gives up his gun, as does Alfred. The guard clears his throat and Alfred pulls out another gun. Then a knife. Then a pair of brass knuckles. Even Gordon is weirded out by the number of weapons Alfred brought. After Alfred furnishes all of his weapons, the guards agree to help them look for Bruce (but one tells Ra's of their presence using a radio). And, in some unnamed Gotham alleyway, Nygma wakes up and again tries to tell Grundy they don't know each other. Grundy, who doesn't believe it, insists that he wants a friend to help him. Nygma insists that he can't even help himself, let alone Grundy, but he seems to warm up to the idea of keeping him around after Grundy gives him a hot dog from a stolen food cart. And back at Blackgate: surprise, there are creepy dungeons underneath the penitentiary, which means Bruce is being held prisoner below the actual prison. Ra's complains that Bruce, by refusing to kill him, is "still playing the white knight." Ra's claims that when he was resurrected, he saw a vision of Bruce and knew that the boy would be the one to kill him. And he actually wants Bruce to do it. Ra's says he's tired of living forever and just wants Bruce to kill him. If that's the truth, it's definitely anticlimactic. Also, aren't most versions of Ra's obsessed with maintaining their immortality rather than giving it up? This feels like a very backwards motivation. Speaking of immortals, Grundy is still hanging around Nygma when the campers he knocked out come back for revenge (because apparently, getting beaten up by a zombie once wasn't enough for them). Grundy manages to take them out for the most part, but one man sets Grundy's arm on fire. Nygma looks like he's about to make a run for it, but ends up grabbing a bucket of water to douse the flames. Grundy points out that it took some brains to think of that solution, and Nygma accepts the compliment before getting pulled into a hug from Grundy. And back at the unnamed, mob-owned restaurant, Sofia tells Penguin that she picked this restaurant for its Hungarian cuisine, hoping it would remind him of his mother's heritage. 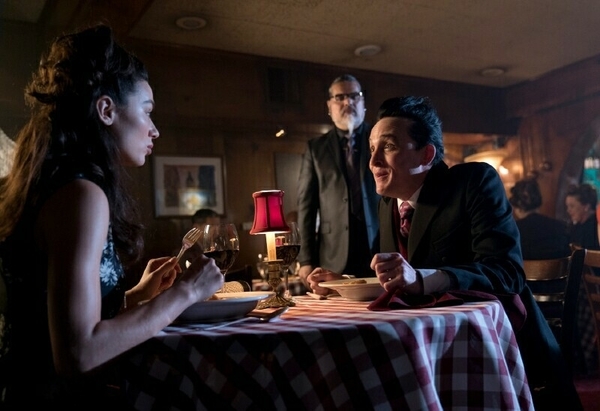 Oswald isn't enjoying the food and says he wanted a more public venue, but Sofia convinces him to try the goulash. He scoffs, saying it can't possibly compare to his mother's 300-year-old family recipe that was brought all the way from Budapest (the same one his stepmother scoffed at). But the second he takes a bite of the goulash, he's visibly disturbed and leaves in a hurry. Sofia says it took her a lot of time and effort to find his mother's exact recipe and asks the cook if she made it properly. What I love about the dynamic between Sofia and Penguin is that she's using the same technique Fish used on Sofia's father Carmine Falcone in season 1: manipulating someone by invoking memories of their beloved mother. However, while Fish used Eliza as a proxy, it seems like Sofia's going to be acting as both the instigator and the actor in this plan. Also, not only did she take the time to track down the goulash recipe, but her hairstyle is also eerily reminiscent of Gertrude Kapelput. Back at Blackgate (a.k.a. Prison-ception), Gordon asks the guards how long they've been working there. One replies two years, but Gordon knows it's a lie because he would've seen the guard during his brief time in prison. He also notices that another "guard" is wearing a uniform with a name that belongs to a guard Gordon actually remembers. Alfred and Gordon jump into action and beat the guards in a nice Bash Brothers moment. When the guards refuse to tell them where Bruce and Ra's are, Gordon says they should try the subbasement. Meanwhile, Sofia shows up at the Iceberg Lounge. Penguin asks why she would go to the trouble of finding his mother's exact recipe. Sofia claims she just wanted to be nice, but Penguin says the only person in his life who was ever kind to him without an ulterior motive was his mother (which is fair, given that Nygma's intentions, even when they were friends, weren't exactly selfless). Sofia says her father was the exact opposite and always evaluated people based on their usefulness to him. She also says that's how people end up alone. As Penguin moves, his leg begins to hurt and he sits down. Sofia kneels and pulls back his shoe, seeing the scars left by Fish in season 1. Penguin is a bit disturbed and tells her to stop, but Sofia starts to massage the wounds as she tells him a story of how she broke her ankle when she was a child. Her father told her to "put some ice on it and toughen up," but her mother took her to the hospital. "Cold actually increases the pain," Sofia recalls. "What's needed is warmth." 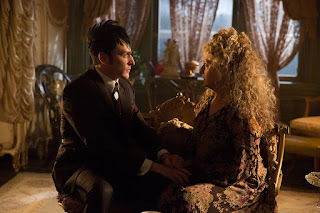 Penguin, moved by the story, admits that his mother used to sing to him, and Sofia begins to hum as she massages his leg (and if I'm not mistaken, I think she's humming his mother's lullaby, which is a great throwback to season 2). But while Penguin is beginning to open up, Bruce is shutting down. He thinks that Ra's is just testing him again and refuses to kill him. Ra's points out that his reflection in the blade shows him as a corpse, revealing his true nature. 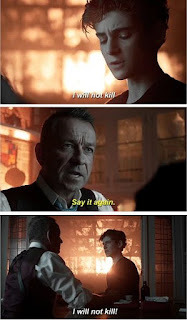 When Bruce refuses again, Ra's offers a chilling ultimatum: if Bruce doesn't kill him, he'll disappear, let Bruce live a normal life and even start a family, and then come back to kill everyone Bruce loves. Bruce, afraid to lose anyone else in his life, stabs Ra's in the chest with the knife, killing him. As he dies, Ra's transforms into a withered skeleton. This probably isn't the end of Ra's al Ghul. Even if Gotham wasn't notorious for resurrecting the dead, the character always comes back in the comics. Also, it doesn't make sense to bring in a big-name character like Ra's just to kill him after only a handful of episodes. This isn't technically Bruce's first kill, if you count what happened in the last season finale. Bruce is fifteen years old. He may have made a vow not to kill, but that doesn't mean he's not struggling with that promise. In a way, the struggle makes his character arc more realistic. This inner conflict has been building since he almost pushed Reggie out of a window in season 1. It continued when he met Matches Malone and later almost killed Jerome. It hit a climax when he had to prove himself to the Court of Owls last season. And it's not just going to automatically go away. If the version of Jim Gordon on this show proves anything, it's that justifying murder is easy. Resisting the urge to kill is difficult. If you think Batman has never struggled with a desire to kill anyone, read Brian K. Vaughan's Batman: Close before Striking. I say all of that because I know this episode is going to be another excuse for critics and comic book purists to condemn Gotham. I, however, think this development might be an interesting move for the series if it's done right. Back to the show: Ra's turns into a skeleton just before Alfred and Gordon arrive to see Bruce standing over him with the knife (and even though Bruce isn't wearing the mask in this scene, he's gonna need a new suit since Gordon's seen this one now). In the aftermath, Bruce asks if Gordon is going to arrest him. Gordon says no, especially since he's not sure what he even saw. Bruce says he betrayed his code and his parents' memory, but Gordon replies: “Just because you know you’re capable of doing something doesn’t mean you have to do it again.” He tells Bruce that he's still the same kid he met three years ago, the one that wants to do good. And this is where Gordon's blind spot for Bruce kicks in. See, Bruce still wants to be good, but he's not playing by the rules anymore. He's not going to work within the law, and Gordon doesn't know that. I think Gordon is idealizing Bruce for two reasons. The first is that Bruce represents what Gordon could have been if he hadn't gone down such a dark path since season 1. Gordon wants to believe that Bruce is a good person, because he wants to believe that, deep down, he's also a good person. The second reason is that almost every person in Gordon's life has changed drastically over the course of the show. I think he's relying on Bruce to be consistent, to be the one person who's not hiding a dark side. I can only hope that vigilante persona won't be gone for the rest of the season. I could see it being out of commission for the rest of season 4a, but I definitely want it back in 4b. Gotham: a Dark Knight has been pretty heavily promoted and Bruce's vigilante persona has been front and center in most of the promos. It would be a cheat to shut down that development so soon. As with Ra's, I'm trusting the writers to bring that storyline back in due time. Meanwhile, in the bad part of Gotham (read: any part of Gotham), Nygma and Grundy go looking for some way to survive. 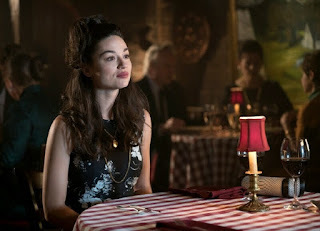 Nygma tells Grundy that they were very good friends when he was alive, and that once the two of them have made some money, they can use it fix Nygma's brain, and then figure out what's wrong with Grundy (a blatant lie, of course). Nygma takes Grundy to a fight club to throw their hat into the ring. The owner says Grundy can fight once he gets his arm fixed up by the doc. And who is "the doc?" None other than Lee Tompkins, who is now sporting Morticia-Adams-esque bangs. So that's it for "The Blade's Path." This is probably the weakest episode of the season so far, but I'm hoping it serves a greater purpose in the overall narrative of season 4. The best part of the episode, in my opinion, was probably Sofia Falcone's subtle manipulation of Penguin. While she's not much like her comic book counterpart at all, I think this show's version of Sofia has a lot to offer. I can't wait to see where her oddly maternal relationship with Penguin leads. Expect another recap next week for "Hog Day Afternoon," which raises a serious question: how did it take us four seasons to get to Professor Pyg? It seems like the ridiculous yet creepy villain was practically made for the tone of Gotham. Until then, comment below with your thoughts, theories, critiques, and complaints of "The Blade's Path."